Word of the Day: IJSJE, ice cream – Welcome to the Direct Dutch institute, The Hague. These are wonderful days for IJSJES (ice creams), I love ice cream and so do my fellow Dutchies. 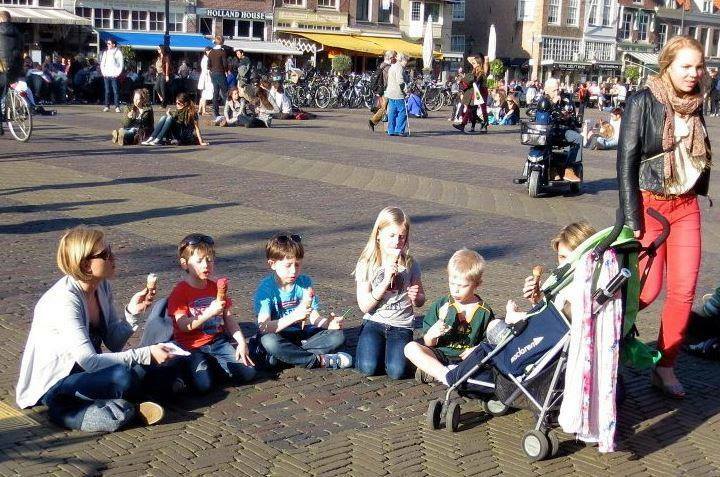 Over the last few years the amount of ice cream vendors has doubled in the Netherlands. The professional name of the person who sells IJSJES is IJSCOMAN. Nowadays the word IJSCO has been replaced by the more modern word IJSJE. According to Nicoline van der Sijs’ chronological dictionary, the first time the word was written down was in 1928. IJSCO was an abbreviation of the word ‘IJscompagnie’. In the period 1926-1950 the IJSCOMPAGNIE was a company which ran ice-cream carts all over the Netherlands. On the side of the cart, which sold ice cream cones, the shortened word IJSCO seduced people to buy this cold delicacy. This summer I’ll return to IJSJES and IJSCO’s whenever the temperature inspires me to do so. For now I’ll stop here, I’ll hop on my bike and rush to a shop where they sell magnificent ice creams. What is your favourite ice cream parlour? Have you any suggestions? Tell me. An IJSJE, LEKKER! ‘Lekker’ is an apt word here because it was derived from ‘licking’. IJSJES are finger licking good. Summer courses at Direct Dutch Institute!